Join us on a jeep tour in the Algarve and discover the hidden treasures of the magnificient westcoast. 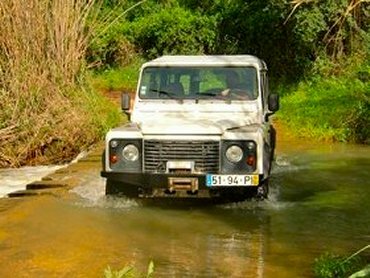 What better way to explore the Algarve than by jeep tour? Use this unique opportunity to have an unforgettable insight into local flora, fauna, history and culture. Experience a trip off the beaten track to local sites shown to you by local people. Sit back and enjoy the ride in our 9-seater Landrover Defender, a vehicle designed & perfectly equipped for an exciting day out on the stunning westcoast. All our jeep tours are sympathetic to the natural environment and pay attention to ecology and wildlife. We drive only on designated tracks and in some places these routes are quite demanding. "The world famous tour of Aljezur"